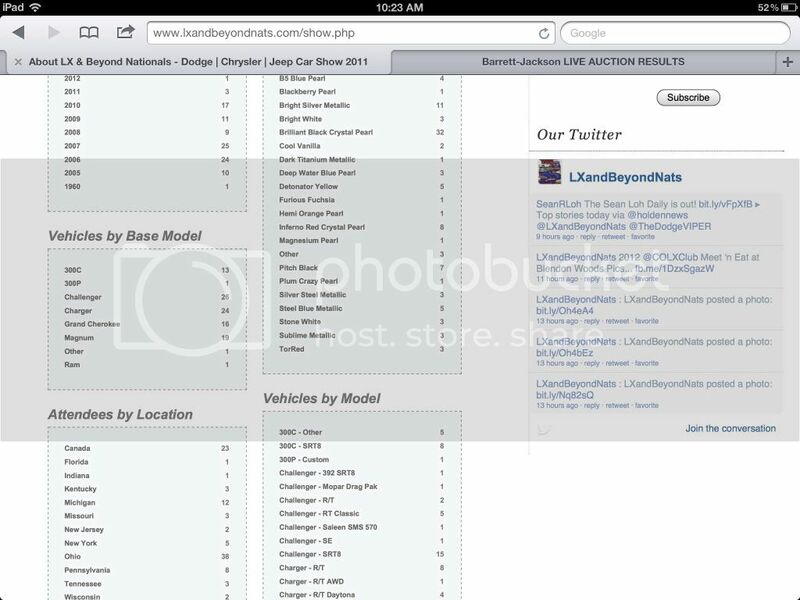 WHAT IS THE LX & BEYOND NATIONALS? Founded in 2008, and based in Ohio, the LX & Beyond Nationals is the ONLY drag racing, car show and entertainment event in the United States completely dedicated to the Modern MOPAR Muscle and Performance vehicles. A grassroots event that began in Spring '07, as a meet-and-greet in a restaurant parking lot in Columbus, OH. This annual event hosts hundreds of die-hard enthusiasts and aftermarket manufacturers from California to New York, from Canada and everywhere else in-between. Enthusiasts interested in showing off their cars, testing its performance limits on the 1320 and learning what is new and available in the aftermarket attend this event every year. The event is open to the public and dedicated to the continued growth of the car hobby. If you own an LX-platform or any SRT performance vehicle (or in the market to purchase one) this is an event you want to attend and see what the cars and the culture associated with owning one is all about. and "Mailed to LX & Beyond Nationals, PO Box 4184, Dublin, OH 43016 No Later Than June 21. If there are any major concerns or questions that you have please don't hesitate to contact me via PM, email (anthony@lxandbeyondnats.com) or phone (614-633-8033). If I'm not available for some reason please leave a message and I'll get back to you as soon as possible or advise a time when you will be available. Thank you! The Modern Street Hemi Shootout Series will return to Ohio again for the 2012 season and will run all day on Day #1 of the 5th Annual 2012 LX & Beyond Nationals on Saturday, July 21, 2012 at Quaker City Motorsports Park in Salem, Ohio. Cars that are eligible to participate in 2012 Modern Street Hemi Shootout Series Heads-Up Classes are 2005-present LX, LC, LD and SRT Jeeps. If you have a Chrysler-powered engine vehicle that is not an LX, LC or SRT Jeep, you may participate in Exhibition and Index. All classes will be run with a Pro Tree. Safety is our primary concern and NHRA safety rules will be followed. Heads-Up Racing for All Gen III HEMI powered LX, LC, LD, SRT Jeep, and all Drag Pak cars including V10. No restriction on weight, displacement,power adders, controllers, transmission, or suspension. Any LX, LC, LD and SRT Jeep not using approved drive train components and or electronics. Will be on a .250 bracket. Not eligible for "King of the Hill". No points or prizes. Just bragging rights. No restriction on weight, displacement, or power adders. Cars (including Jeeps) with a solid rear axle must use a Nag1 or factory type 6-speed transmission. Cars that have been converted from Nag1 to any other transmission (TH400, Powerglide, etc) must use IRS suspension. Cars (including Jeeps) with both solid rear axle and converted transmission must run Exhibition. See Notes 1 & 2 at bottom of page. Heads-Up Racing for 2005+ Gen III HEMI powered LX, LC, LD, and SRT Jeep with power adder (forced induction or nitrous). Engine displacement limited to 6.1 liters with one exception. OEM 6.4 (392) allowed when using stock bottom end. No power adder restriction when using stock bottom end (any turbo setup including twins, any superchrger, any nitrous setup). No twin turbo setups. Single turbo limited to 76mm. Superchargers restricted to maximum positive displacement of 3.0 Liters. Centrifugal blowers no larger than Procharger D1, Vortech V1 T trim, Paxton 1500. Nitrous systems limited to plate system. Naturally Aspirated cars over 468 cubic inches, and Naturally Aspirated cars not meeting weight restrictions for Stroker or Super Stock class. Naturally Aspirated cars: No weight minimum for N/A cars. Cars not meeting minimum weight requirements will compete in Unlimited. LX,LC,LD must have IRS Suspension. Naturally Aspirated Heads-Up Racing for all 2005+ Gen III HEMI powered LX, LC, LD, and SRT Jeep with stroked engines up to 468 cubic inches (including factory VCT 392). Accepted fuels are pump gas, any commercially available race fuel, or E-85. Any additional fuel system including water methanol systems are prohibited and may not be present on the vehicle. All 2005+ Gen III LX, LC, LD, and SRT Jeep (including HEMI, V6, and both V8 & V10 Drag Paks) are allowed to compete in this class. Index runoff between the class winners of Super Stock, Stroker, Pro and Unlimited. Random pairing on a .250 bracket. All Cars except Exhibition and Index must run factory engine controllers. Approved engine controllers are NGC 3, 4, and 4A models as well as GPEC 2. Super Stock, Stroker, Pro and Unlimited (Unlimited only when running solid rear axle) are required to have NAG1 Transmission, or six speed manual transmission. Six speed entries must be production style units with the standard H-Style pattern. Sequential or clutchless transmissions are prohibited. Clutch must be conventional, slipper clutches prohibited. The Inaugural Mopar Heritage & Beyond Racing Series will kick off its first season in Ohio and will run all day on Day #2 of the 5th Annual 2012 LX & Beyond Nationals on Sunday, July 22, 2012 at Quaker City Motorsports Park in Salem, Ohio. Cars that are eligible to participate in 2012 Mopar Heritage & Beyond Racing Series are 2005-present LX, LC, LD, all SRT cars past and present, and 1960-1978 Dodge, Chrysler, Plymouth B-Body and E-Body vehicles. 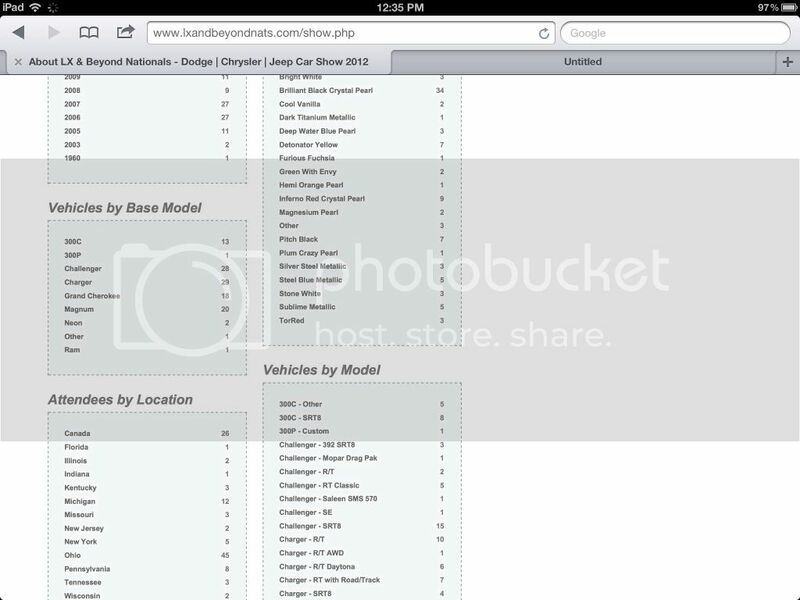 If you have a Chrysler-powered engine in a vehicle that is not listed, you may participate in Exhibition and Index. All classes will be run with a Pro Tree. Safety is our primary concern and NHRA safety rules will be followed. Heads-Up Racing for All Chrysler-engine powered vehicles. No restriction on weight, displacement, power adders, controllers, transmission, or suspension. LX, LC, LD must have IRS Suspension. Qualifying is closest to Index without running under. Delay boxes, cross-over boxes, or any “reaction-time related” electronic bracket racing aids prohibited in this class. Throttle stops, delay boxes and all related throttle-stop type accessories prohibited. Trans brake and 2-steps permitted. All Modern Mopar and Classic Mopar Cars (including HEMI, V6, and both V8 & V10 Drag Paks) are allowed to compete in this class. All facility rules apply and will be enforced by track employees during the event. Drivers must have all the proper safety equipment including apparel designated by the track’s sanctioning body. Multiple vehicles registered by one person are allowed but there must be a driver for each vehicle. One Car, One Driver. Vehicles allowed to race side by side are determined by track rules. Lane choice goes to quicker car. All races will be run on a .500 pro tree. All vehicles required to make at least one (1) qualifying pass. Minimum two (2) qualifying rounds. Once a vehicle has been eliminated in a class, they cannot enter another class. Any Index Class without a minimum of 4 Cars will have option to Test and Tune. Double breakout – car breaking out the least wins. Turbo, supercharger and nitrous allowed. Fuel injection or carburetors allowed. Full-bodied Chrysler/Dodge/Jeep/Plymouth cars with bumpers, hood, grille, top, windshield and functional doors. Modern Chrysler Cars (including Jeeps) with a solid rear axle must use a Nag1 or factory type 6-speed transmission. Modern Chrysler Cars that have been converted from Nag1 to any other transmission (TH400, Powerglide, etc.) must use IRS suspension. Vehicles must pass NHRA rules for the ET the vehicle runs. Nitrous controllers are allowed for controlling nitrous only. Mufflers required. Car must be “street” muffled. Back-half cars not allowed in any Index Class. The LX & Beyond Nationals will once again be hosting a Car Show for the 2012 season and will run on Day #1 of the 5th Annual LX & Beyond Nationals on Saturday, July 21, 2012 at Quaker City Motorsports Park in Salem, Ohio. 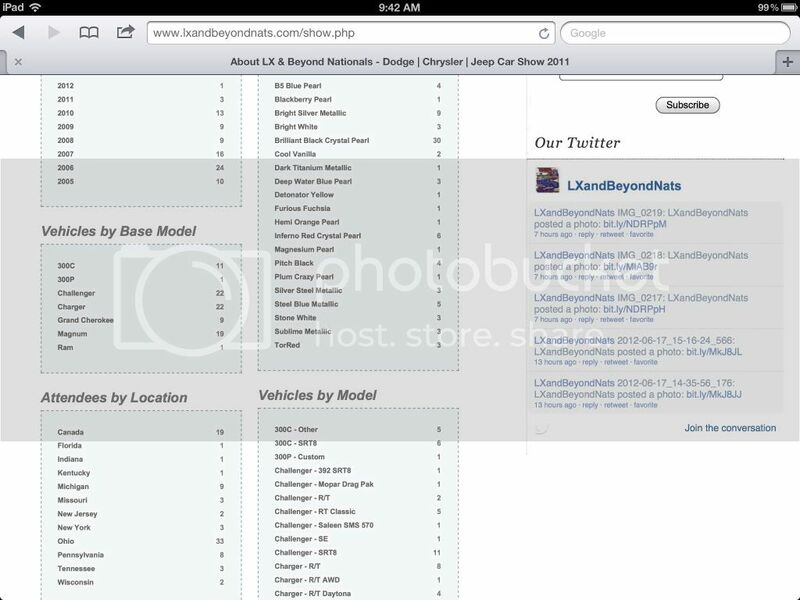 Cars that are eligible to participate in the 2012 LX & Beyond Nationals Car Show are 2005-present LX, LC, LD and SRT Jeeps. If you have a vehicle with a Chrysler-powered engine that is not an LX, LC, or SRT Jeep, you may also participate. This is awarded to the vehicle with the best overall balance of quality for their respective classification. It should be truly different and stand out from the crowd. The paint should have the cleanest finish of any vehicle on the show field. Engine should have some visual modification. Stance of vehicle should be non-stock, and/or wheels should complement the overall appearance. Interior should also have some modification. This is awarded to the Top 10 cars that stood out to the experts but did not meet the qualifications for a Best of Show award. This award can be given to any combination of vehicle qualities: all original, low miles, unique modification, etc. This is awarded to the car that has the best quality paint job i.e. no chips, orange peel, dull spots fading, etc. The paint should have the cleanest finish of any vehicle on the show field. The paint must be finished throughout the entire vehicle including the door and trunk jambs and of course the engine bay. The paint color and quantity of colors is not a factor for earning this award. This category awards the overall presentation of the engine, which includes polished / chromed parts, powder coated parts, color-coated hoses, and most importantly the cleanliness and presentation of the entire engine bay. Such factors as wire tucks and shaved engine bays will also play a determining factor, your Engines performance abilities have no bearing in this category. To compete for an undercarriage award, the vehicle should be elevated on stands or ramps. Mirrors should be placed under the vehicle, to display undercarriage modifications. Undercarriage detailing such as painting, powder coating, polishing and / or chroming, are all factors as well as, sway bars, urethane suspension bushings and other chassis stiffening modifications will be considered too. Any other creative ideas that can enhance the undercarriage will also be taken into consideration. This award is presented to the person who has customized their interior following a specific theme. Interior themes could include a one which will consists of many rare parts from overseas or show car theme which may include lots of fiberglass to hold audio and video components. The use of exotic materials and original ideas will also be taken into consideration for this award. To be eligible for this award, the vehicle must be driven into the venue by the vehicle’s female owner, and the car must be registered for the show under her name. It is also IMPERITIVE that she presents her car to the expert at the show. Experts are not only examining the workmanship that went into the vehicle, but we are examining her knowledge about the vehicle too. This is awarded to the person with the cleanest, most customized stereo install. This includes speakers, head-units, amps, and overall installation of the stereo equipment. It’s not the quantity of equipment, but the quality of the install that concerns the experts. Does the install include custom fiberglass painted enclosures? Are the components highlighted with lighting? Are all wires neatly wrapped up and out of sight? Does the overall fabrication and custom work match the car’s theme? The creativity and uniqueness of installation also plays a large factor in deciding this award. ICE examines non-stereo equipment. Some examples of ICE would include: multiple TV’s, gaming systems, computers, navigation, cameras, and interior lighting. Most importantly experts are looking for unique features, such as unusual locations for televisions, hidden gaming systems in armrests, multiple screens with multiple functions, and smooth clean installs. *NOTICE: Will Be Judged Saturday Night at the Host Hotel. This is awarded to the vehicle with the most detailed exterior lighting display. Exterior lighting would include: spot lights, rope lights, neon, strobes, track lighting, and any other lighting equipment to enhance the exterior presentation and display of the vehicle. It is not the quantity of lighting, but rather how the lighting is used to better the presentation of your vehicle that will earn you the chance to win this award. *NOTICE: Will Be Judged Saturday Night at the Host Hotel. Club/Team members should be at the show for its entire duration. The members should be wearing club attire, such as: t-shirts and/or ball caps. This award if for the club/team who entertains the crowd for the duration of the show, with such features as: music, lighting and interactive activities to keep the crowd drawn to your organizations vehicles. This is awarded to the person that drives the longest distance in their own vehicle to the event. In the event of a tie, driving time based on evaluation of Google Maps will be used to determine winner. To be eligible for this award the owner of the vehicle must be a registered participant. However, the vehicle does not have to be participating in the car show or racing activities of the weekend. This award is voted on by everyone in attendance on the Saturday and after all votes have been tallied will be awarded on Sunday morning. This award is for the vendor/company who entertains and interacts with the crowd for the duration of the show, with such features as: interactive activities, drawings, display vehicles, racing vehicles, etc. to keep the crowd drawn to your display area. Yea, this is gonna be the LX gathering of the summer if you didn't already know it. HUGE THANKS to COLXClub and BLXClub members for spreading the word all over Ohio, the numbers don't lie. CANADA crew, no words, you guys are awesome! The level of enthusiasm you're showing is unmatched! Keep spreading the word everyone. The more of everyone that is there, the more fun it is for all. If you have not registered already, GET REGISTERED! Online will close July, 7!!! 100 RSVP's and counting! That's what we want to see. Keep 'em coming. Stay tuned for a BIG announcement this week!!! You want to hear this one. Got friends that have Older or Classic Mopars? Tell them to bring them out on Saturday, July 21 for carshow and/or Sunday for (All Mopar) Racing on Sunday, July 22 - Mopar Heritage & Beyond Racing Series. Spread the word. Less than 7 days to register online and save some money $$$! See everyone soon!! !